Even when you have gone on more interviews than you can count, job interviewing never seems to get any easier. With each job interview, you are meeting new people, selling yourself and your skills, and often getting the third degree about what you know or don't know. And, you need to stay upbeat and enthusiastic through it all. This can be a challenge, especially when you're interviewing for a job you would love to get hired for. That said, there are ways to make a job interview feel much less stressful. Just a little preparation time can go a long way. The more time you take in advance to get ready, the more comfortable you'll feel during the actual interview. Remember, though, that a job interview is not an exam: you don’t need to study for hours on end. Rather, you just need to do due diligence in researching the company, understand exactly what they are looking for in a new hire, and ensure that you’re able to discuss your experience and what makes you a great fit for the job. It is a good idea to focus on your communication skills in particular, so you can speak clearly and concisely about the assets you can offer the employer. Ultimately, the key to effective interviewing is to project confidence, stay positive, and be able to share examples of your workplace skills and your qualifications for the job. Take the time to work on your interview skills so that you can develop effective interview strategies to use in all of your interviews. With some advance preparation, you'll be able to nail the interview and showcase the experience that makes you the ideal candidate for the company's next new employee. Review the typical job interview questions employers ask and practice your answers. Strong answers are those that are specific but concise, drawing on concrete examples that highlight your skills and back up your resume. Your answers should also emphasize the skills that are most important to the employer and relevant to the position. Be sure to review the job listing, make a list of the requirements, and match them to your experience. 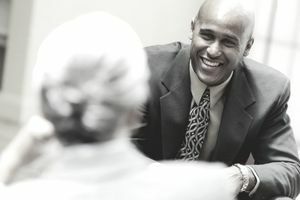 Ultimately, building rapport and making a personal connection with your interviewer can up your chances of getting hired. People tend to hire candidates they like and who seems to be a good fit for the company's culture. Do your homework and research the employer and the industry, so you are ready for the interview question, "What do you know about this company?" If this question is not asked, you should try to demonstrate what you know about the company on your own. Don't wait until the last minute to pick out an interview outfit, print extra copies of your resume, or find a notepad and pen. Have one good interview outfit ready, so you can interview on short notice without having to worry about what to wear. When you have an interview lined up, get everything ready the night before. Not only will planning out everything (from what shoes you will wear, to how you’ll style your hair, to what time you will leave and how you’ll get there) buy you time in the morning, it can help reduce job search anxiety, and it will also save you from having to make decisions, which means you can use that brain power for your interview. Watch Now: How Honest Should You Be in an Interview? What shouldn't you do when interviewing? Here are the most common job interview mistakes, blunders, and errors a candidate looking for employment can make. Take the time to review these mistakes before your interview, so you don't have to stress out about blunders after it. Review tips on how to handle interviews that are different from a typical one-on-one meeting. These include tips for phone interviews, second interviews, lunch and dinner interviews, behavioral interviews, interviewing in public, and more advice for interview success. Also review these signs that your job interview went well, so you can see what skills you may need to brush up for next time. How Teens Should Answer: Why Do You Want to Work Here?